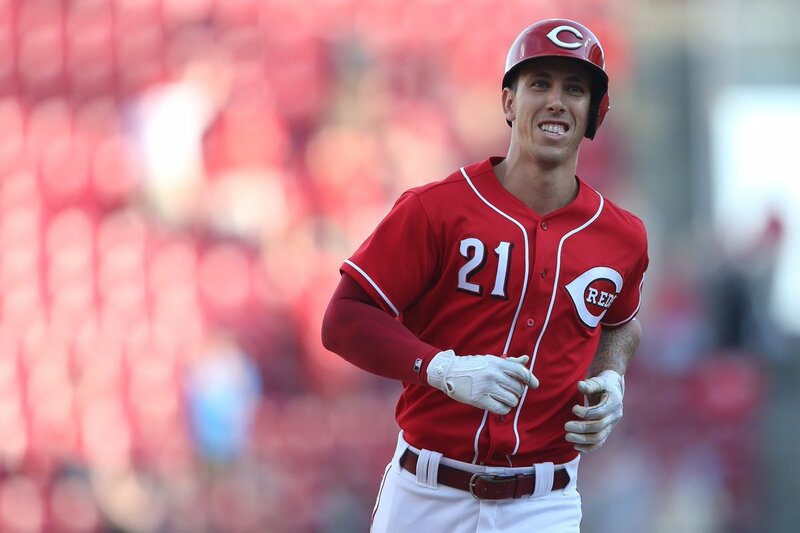 The Short Version: Reds win next-to-last game of the season behind a strong start from Michael Lorenzen. –Very nice outing for Michael Lorenzen in his third start of the season: 5.2 shutout innings, allowing just five hits. Once again, interim manager Jim Riggleman had the quick hook, but it certainly worked out for the Reds. I wanted to see Lorenzen either pitch a complete game, or finish the contest in left field. As with so many things related to the Cincinnati Reds, I was to be disappointed. –Mason Williams had three hits, all singles. No one else had more than one hit, but the Reds did hit for the cycle: Dilson Herrera had a double, Billy Hamilton had a triple, and Eugenio Suarez hit his 34th homer of the season. –David Hernandez, Jared Hughes, and Raisel Iglesias pitched 3.1 innings of one-hit, shutout relief. –Nothing bad, for one day at least. –Only one game remaining in the 2018 season. If the Reds can manage a win tomorrow, they’ll finish with a 68-94 record for the third consecutive season. –The game was scoreless until the bottom of the third, when Hamilton tripled into the right field corner with one out. Jose Peraza followed with a sacrifice fly, and the Reds had the only run they’d need. They got two more in the following inning, however. Suarez led off with a solo homer to center. Then, with two outs, Herrera doubled to left. Michael Lorenzen singled him home, Lorenzen’s 10th RBI of the season. That gave the Reds a 3-0 lead that would hold up for the rest of the day. –The Reds will wrap up the season tomorrow afternoon, with Big Sal Romano taking the mound. Winter is coming. That was Lorenzen's 10th RBI of the season, the most of any batter whose primary position is pitcher. He has 5 RBI as a pitcher and 5 RBI as a pinch hitter. I like Lorenzen as a starter, gives us an extra bat in the lineup.. allows him to PH on off days. Well the one thing they got right in the off season was picking up two good relievers.. so maybe they can add one more to the mix. Yeah, that was a horrible ball four call. If that’s called correctly it’s strike three and the innings over. I want to go on record and say we need Homer Bailey as a starter next year. Starting pitching is so dicey, he may rebound.. we are paying him a ton… he is a bit of a headcase and everytime I watched bad luck occurred behind him defensively which would seem to set him off, dude has a terrible temper is way too emotional… but he has everything to gain and is in his prime he must be given another opportunity… Make him the #4 pitcher and hope for the best. Then you got Lorenzen, Disco, and Castillo… and so many young arms.. I think they are crazy if they spend big money on a free agent or add an “innings eater” to take innings away from the young arms. Spend that many by upgrading CF in a big meaningful way. Hell, throw so much money at Harper he can’t say no and stick him in CF. Stick with the short leash approach and upgrade the bullpen. Don’t gamble on starting pitching it is too dicey and volatile. Homer could be just as good as a free agent pick up with better luck and temperment. I am into this idea… then we make Senzel a super sub, basically an everyday player, subbing all over the place OF/IF … Harper puts a jolt into this offense, they might make the playoffs if Homer can be serviceable or one or more youngsters emerges… enough with half measures go for it, take some risk. I am 100% in the camp of “window realistically starts in 2020 or 2021…don’t make more mistakes now to louse that up.” But, your plan offers a way to try and improve without limiting the team’s future options. If Hamilton is here, then the Reds are humoring Big Bob and/or quietly punting on 2019. This team needs more HRs in addition to better pitching. I agree with your premise of not spending big time money on a FA pitcher. It’s too risky and would set the Reds back significantly if it doesn’t work out. The Reds can’t spend their way out of contract mistakes like other bigger market clubs, so they have to try to avoid them as much as possible. I don’t agree at all about bringing Homer back. The money is a sunk cost. Just as it was this year even though they basically paid him to just hang out in the dugout for the last month. He’s also not in his prime, not even close really. Homer will turn 33 next May, he’s a few years past his prime and hasn’t been good for a while. The Reds have a group of pitchers (Mahle, Reed, Lorenzen, Sims etc) that can adequately fill the #5 spot in the rotation, which is about the best we could hope for out of Bailey, and that would be a big bounce back from being the worst pitcher in the league. I believe the Reds should target Kikuchi from Japan. They likely won’t have to pay as much for him as they would Kershaw, Corbin, or Keuchel, but he may end up being just as effective. Then trade for a guy who can slot in the middle of your rotation but where you won’t have to give up any of Senzel, Greene, or Trammell. Probably thinking a bounce back candidate like Stroman or Bundy, or someone similar. Combine those guys with Castillo, Disco, and pick a 5th starter from internal candidates. Then yes, you have to figure out CF. If Senzel can play it, stick him there and move on from Hamilton to save some money. Ervin and Williams can adequately back up CF if you need them too. If Pollock doesn’t get a QO I’d like to see the Reds target him. If he does, it would be hard to give up the Comp. A pick to sign Pollock. If not Pollock, then explore trades available. I’ve seen a lot of comments similar to this regarding compensation if Pollack receives a qualifying offer. The rules have changed and this comment relates to the previous rules, not the current rules. If the signing team received revenue sharing and didnÃ¢â‚¬â„¢t exceed the luxury tax threshold in the previous season, the team only has to surrender its third-highest pick in the next draft. This is the compensation applicable to the Reds if they sign a FA tied to a QO. This will still be a 2nd round or a Comp B selection, but not a Comp A selection. Well that’s nice to know. Thanks for the info. I knew the rules had changed but hadn’t researched enough to know how that effected the Reds this year. Even the Reds second round pick may be pretty steep, as it’s likely to come in around 50th pick, not to mention they would lose the bonus slot for this pick, correct? Sometimes the slot money is more important than the actual pick. This was last year’s strategy. Don’t “give” homer anything. He has to go to spring training and earn it. Sadly, it looks like he will be playing in front of the same infield next year, so he better get tougher mentally. The worst defensive infield since I started stated listening to Waite Hoyt with my dad. The reds didn’t keep Lopez around for shortstop and he was an excellent hitter. Senzel is a defensive upgrade at 2nd, 3rd, and probably ss. A fundamentally poor baseball team. It seems an organizational issue. How can players be in your organization for multiple years and show up in Cincinnati and not know how to hit a cut off man. And the cut off men can be in the wrong spot. Enough, I still hope for magical turn around next year. But I won’t go to Vegas to make a preseason bet on the reds. A big part of it is that the organization is too player-friendly. Has there been a Reds player called out for anything this season? If the organization believes in Peraza and Gennett as much as it appears they do, this infield could be the same for 4-5 more years. If so….old, used to losing, no threat of being replaced or even called out. Imagine the defense being played in the future with this infield. Yikes. Just checked in to see we won which is always better then losing.Lots of hope for the off season and lets see what happens.One thing I really hope happens is that decisions are made on all these young pitchers and I am good with who starts or who relieves or who goes back to the minors.We have discussed all year about this guy and that guy and anointed some and some we have thrown under the bus only to drag them back out again.I have understood it all except the dragging them back out again.Make a decision on Bob,Reed,Romano,Tyler,Lorenzen,Garrett,Wisler,Castillo and I am sure I missed some and move on.If 20 starts is good enough to make a decision on one guy then do it.If its 50 starts is the mark for this guy then do it and move on.I know they live in fear of one of these maybe getting it somewhere else and guess what they may but make the call and lets go forward.The organization is not moving forward at all with this rebuild because of this insane practice of recycling players.Fishing awhile then cutting bait awhile never ever accomplishes anything.Use them,trade them,cut em or send them down. Here some data that will show opportunity given and the results of that opportunity for our young pitchers. I will list the pitchers in order of games started and contrast their numbers with games in relief. Based on ERA as a starter the list would go: Mahle (4.64), Stephenson (4.77), Wisler (4.88), Romano (5.10), Lorenzen (5.13), Sims (5.79), and Reed (6.89). Based on ERA as a reliever the list would go: Reed (1.98), Lorenzen (3.68), Romano (3.77), Wisler (6.31), Sims (6.55), Stephenson (8.13). Reed has a slight lead over Wisler when it comes to K/BB as a starter. Wisler has a slight lead over Romano when it comes to K/BB as a reliever. Romano, Lorenzen, and Reed decrease their WHIP as relievers. Wisler and Sims’ WHIP stays relatively the constant. Stephenson’s WHIP is way worse as a reliever. Wisler, Stephenson, and Sims (slightly) have been better as starters than relievers. Reed, Romano, and Lorenzen have all been much better as relievers than starters. Mahle has only performed as a starter at this point. Only Romano and Wisler have been given more than a season’s worth of starts (30) and Mahle is pretty close to a full season’s worth of starts. Only Wisler and Lorenzen has more than 30 IP from the bullpen. Extrapolate what you will from those numbers. To me it says we need don’t have enough data on anyone other than Wisler, Romano (as starters) and Lorenzen (as a reliever) to know a whole lot of anything. I would certainly keep trying to find opportunities for Mahle and Stephenson as starters. Reed probably deserves more of a chance as well based on this season’s results. Solid analysis and I concur about not really having enough of a sample. That, is the failure of the 2018 much more than the record. Win tomorrow and management will have all they need to keep every one around for another run. Ya know, don’t want to get in the way of positive momentum. A turnaround series win tomorrow and the contract for Riggleman will be ready for signing on Monday. I hope common sense will prevail this time and a younger, more aggressive Manager is hired this time. ItÃ¢â‚¬â„¢s been really boring all these years of Mr. Toothpick, Mr. Futility and Mr. Fundamentals. There were some pretty good years when Mr. Toothpick was the manager. Better playes, generally, but the quality of the players is a huge factor in the success of any manager. Certainly, if Castillo, Disco and Lorenzen can manage to provide a minimum level of consistency itÃ¢â‚¬â„¢d make things a lot easier for FO. However, I think that expecting a rebound from Bailey itÃ¢â‚¬â„¢s just too much. I believe that at least one more starter can be slotted from all young arms, letting one more to be obtained via FA or trade. 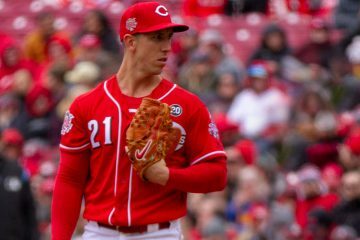 Interim Jim has to go, but Michael Lorenzen can stay and play for the Reds. I don’t know if they’ll give him a Silver Slugger award for this year but he deserves it and any recognition for the Reds is welcome in the wake of this disappointing season. SS for Lorenzen and another OBP title for Votto. Now tomorrow is a must win, just for the sake of that three-peat record. Go Reds! I’d consider buying one of those pennants, but they have to win, first. People still thinking Homer Bailey can pitch and should be brought back. I agree, and on a similar note I just bet 20.00 on Custer to win at the Little BigHorn. Homer’s done. Trade for atleast 1 starter with #2 potential (Wheeler?) and cut Billy loose. Otherwise there’s no reason to watch another 6 month long dumpster fire. Lorenzen is one of the best arms on the Reds. Granted thats like being one of the friendliest members of the Manson family, but you have to start somewhere. He needs to start. Castillo has to turn into a monster #1-#2 guy or the Reds have no shot. Disco? Blah? #4 maybe? If he was the 5th starter then they wouldn’t look that bad? They need a big time arm from somewhere and we have the farm system. I never watched the Griffey/Dunn Reds on a daily basis, so don’t know why I got hooked with this bunch, but I’m cutting the cord next year if they don’t do something different? Lots of good arms on the Reds, but few who have an idea what to do with those arms. I expect I’ll gradually relent, but if the Reds don’t make some substantive changes this offseason, I may be too unenthusiastic to pay for the MLB package next year. Catch up on the reading and the paddling. Of course, a win today–averting the dreaded 95 loss season–might cheer me up immeasurably. 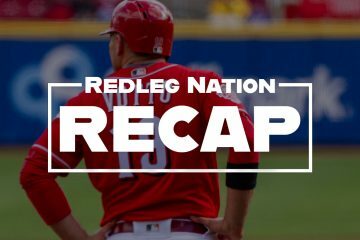 Reds enter the last day of the season with a team ERA of 3.70 for the month of September. That’s good for 8th place in the ML. 7th place currently belongs to the Pirates with a Sept. team ERA of 3.67. It’s possible the Reds could surpass them with a great performance by Romano today. As bad as the Reds pitching has been this year, currently they are pitching competitive baseball. I’m not for making sweeping changes, spending hundreds of millions of $$ on pitching, or trading our best prospects this offseason. Beginning 2019 with a rotation of Castillo, DeSclafani, 1 new guy, Lorenzen, and either Bailey, Reed, or Stephenson works for me. Adding a reasonably priced lefty “swingman” who could both start & provide long relief would also be a big help. Much more than that would be a little premature. I’m not saying the Reds will have a top ten pitching staff in 2019, but with 1 or 2 additions, plus properly utilized, I don’t see them as a 24th or 25th place staff either . The most exciting thing for me Sunday is that the Brewers and Cubs are in a dead heat for the NL Central title. Each controls their own destiny or neither controls their own destiny depending which way you want to look at it. If they both win (or both lose) Sunday, there will be a playoff game for the NLC. The consolation prize is a spot in the Wildcard game. GO BREWERS! Like everyone else, I have other interests than just being a lifelong Reds fan. And if the following are de rigueur in 2019 such as Hamilton as the starting centerfielder and Riggleman and Harvey extended, then my interest in the Reds in passing will increase. For those that feel a manager has little to no impact on a team or organization, Alex Spier of the Boston Globe penned a fascinating article on Alex Cora’s organizational and team impact since he was hired. It focuses in on the BoSox approach during their hiring process and Cora’s expectations going through the interview and hiring process. Spier also includes antiquated ideology regarding the integration of analytics by none other than Dusty Baker. there is really nope hope for a successful rebuild and return to competitiveness under the current ownership.